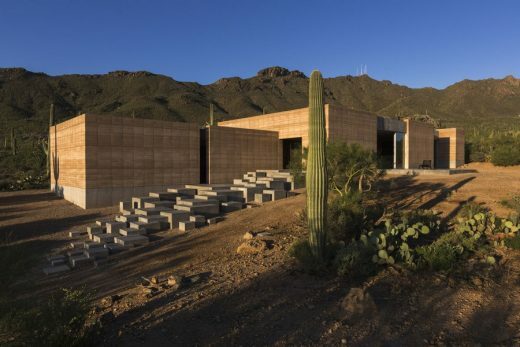 This is an extraordinary new house in Arizona. Made of rammed earth, the Tucson Mountain Retreat is “of” the desert as well as “in” the desert. It sits lightly on the site, with a shifting definition of inside/outside. The project was one of the 2013 “Record Houses” included in the April issue of The Architectural Record. The homeowners are Karen and David Francis whose primary residence is in San Diego. David grew up in Arizona so the Tucson Mountain Retreat and living in the desert are like a homecoming for him.